Home / Food and Drink / Desserts / The Craziest Food Hybrids Ever: Genius Or Just Gross? If the happiest day of your life was when croissant met doughnut and spawned a sugary lovechild then never fear, the cronut craze isn't over yet. Luckily for you, there are also other people who aren't satisfied with baked goods being simply what they set out to be. 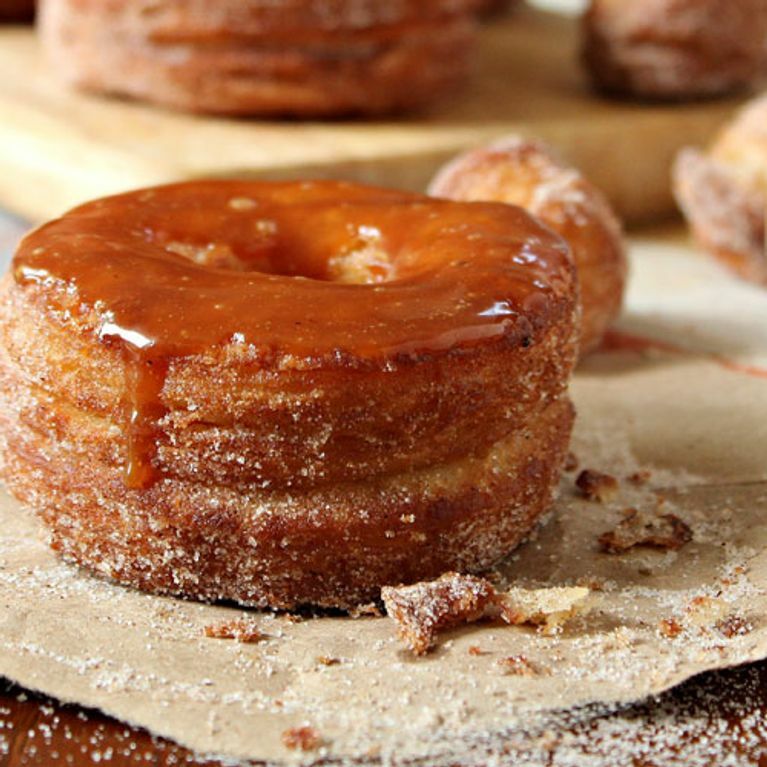 The cronut has started a revolution and now there are loads of even more amazing food hybrids out there. So what's the latest? The Cragel - and we want in. Yes, it's true food hybrids might have gone a bit far, but if you've tasted the deliciousness that is a cronut then you already know that food hybrids have the potential to lead to total taste haven. So what's the latest? Soon enough, there were cronut copycats everywhere, including in Brazil, Taiwan, the Netherlands even South Korea. But while cronuts are getting a lot of attention at the moment, the dessert certainly isn’t the only successful food hybrid out there. We've rounded up the coolest and tastiest food combos for you to test out. Yes, we admit that some of our choices are a little extreme, but who says you can’t add a little risk to your dining experience? As long as it doesn't end in food poisoning, we're game! The reviews are in and the Cragel is a big old hit. An ambitious Brooklyn Bagel store are trying to make 2014 the year of the Cragel, and so far it seems they're off to a flying start. Combining a croissant and a bagel (but how did you guess?! ), this addition to the growing mountain of food mashups is an apparent winner. The Duffin has caused quite the controversy between coffee giants Starbucks and underdog Bea's of Bloomsbury over trademark issues recently, but one thing's they can both agree on - whoever did come up with the idea is a total genius. You got it, a duffin is a cross between a doughnut and our forgotten friend, the muffin. Supposedly a 'healthier' option than a plain old Krispee Kreme, you can now pick one of these bad boys up from almost every corner in London (i.e. at Starbucks). There is nothing like the smell of a sweet, hot Cinnabon. Between the sticky icing and warm filling, it’s like heaven in your mouth. But if the famously fattening treat just isn’t doing it for you anymore, you can up your game with the Pizzabon, a Cinnabon with pizza toppings. Who says you have to choose between dinner and dessert? Are you a fan of hot dogs? How about eclairs? Now you don’t have to pick one over the other. This deluxe hot dog combines chocolate, whipped cream, sprinkles and sausage to make this sweet and salty combo. Is your stomach up to the challenge? Just when you thought there couldn't be another kookie combination for the doughnut out comes Waitrose's masterpiece - the Yumdough. A cross between a Yum Yum and a doughnut, these pastries come in four flavours including chocolate & orange, all covered in flavoured fondant. At £1.49 we challenge you to find fault. Craving brunch? We found the perfect entrée for you. The Luther burger, named after R&B legend Luther Vandross, is a burger sandwiched between two glazed donuts (usually Krispy Kreme). You might want to start saving your calories now – one burger typically contains anywhere from 800 to 1,500 calories (ouch!). You’ve probably heard of this food combo before. The ramen burger takes the college food staple – ramen -- and stuffs a meat patty in between. Being broke doesn’t seem so bad after all. After the cronut, this delicious grub is the trendiest hybrid to chow down on, so you better test it out before the lines get too unruly. Don’t let the name fool you; the bronut is for us gals too. Adding bacon to anything is a big improvement, especially when it’s something sweet. By sprinkling some of the delicious meat on top of doughnuts, we just got a little bit closer to heaven. Bacon lovers, rejoice. Just when you thought it couldn't get any more out of control, in came the turkey burger...This genius (or just plain gross) idea was hatched by Zucker Bakery over in the US as a way to celebrate Thanksgiving and Hanukkah by combining your dinner with a sufganiyah (a traditional Hanukkah doughnut) all in one mouthful. Clever. It comes in a few flavours including spiced pumpkin with cranberry and turkey, sweet potato with toasted marshmallow filling, and spiced pumpkin with turkey AND gravy filling. Our one concern? They look totally delicious...eep.